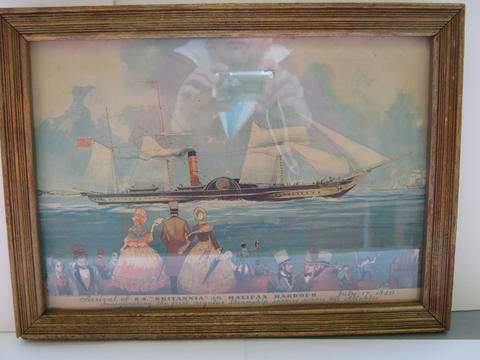 This item is a framed color print of the "Arrival of S.S. 'Britannia' in Halifax Harbour,,, July 17 1840 Inaugurating the first regular Steamship service across the Atlantic". These words are written along the bottom of the image but do not appear to be on the color print. The image shows the ship hauling in her sails as she approaches the pier filled with people dressed in fancy clothes , wearing top hats and fancy bonnets. This appears to be a print of a watercolor. The frame is painting with a gold metallic paint and has a glass front. Information pages from Wikipedia about the Britannia are in the finding aid.